The U. S. Fish and Wildlife Service bears the Federal responsibility for the protection and management of many wildlife forms including migratory birds and endangered species, and their habitats. The Mattamuskeet Refuge aids in fulfilling this responsibility by providing habitat and protection for large concentrations of overwintering ducks, geese and swans, and certain endangered species. Migratory birds are not the only animals that benefit from the refuge. A large variety of wildlife is protected in order to provide the opportunity for people to see wildlife in its natural environment. Mattamuskeet's climate is characterized by hot, humid summers with temperatures occasionally climbing above 95 degrees Fahrenheit, and moderate winters with temperatures seldom going below 20 degrees Fahrenheit. The annual average precipitation is 52 inches with a period of heavy rainfall from July through September. Snowfall is rare and seldom exceeds 2 inches. On rare occasions portions of the lake freeze, but never for a long period. Marsh areas frequently freeze in January and February. Mattamuskeet NWR lies in the middle of the Atlantic Flyway and provides a valuable wintering area for the waterfowl using this migration route which extends from Canada southward. Thousands of Canada geese, snow geese, tundra swan and 22 species of ducks overwinter on the refuge annually. Although noted primarily for its waterfowl, Mattamuskeet also provides habitat for endangered species such as the bald eagle and peregrine falcon. Deer, bobcats, otters, black bear, 240 species of birds and other wildlife species are endemic to the area. Following the refuge establishment, the numbers of puddle ducks and geese drawn to Mattamuskeet appeared endless and peaked in 1960 when more than 100,000 Canada geese and 200,000 ducks wintered there. A drastic decline in their numbers began soon after and continued until the mid 1980s. In the mid 1960s, the refuge initiated a long-term habitat enhancement project to optimize wintering waterfowl habitat. The project's focus was on refuge areas historically used by Canada geese and puddle ducks. Between 1967 and 1981, over 2500 acres of low quality marsh were impounded and restored to conditions that favored the production of waterfowl foods. Currently, manipulation of water levels and mechanical vegetation control in the impoundments produce impressive stands of natural waterfowl foods such as wild millet, panic grasses and spikerushes. In addition, dense beds of submergent vegetation desired by swans, diving ducks and some puddle ducks, are produced naturally in Lake Mattamuskeet. 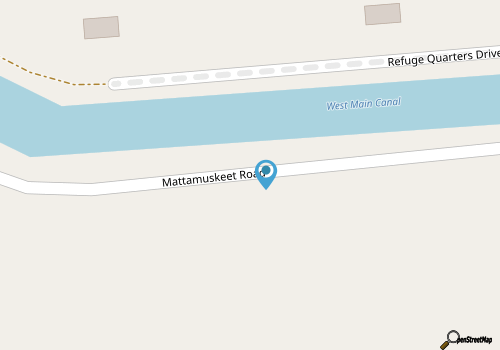 Boating and sport fishing for largemouth bass, striped bass, catfish, bream and other species is permitted on Lake Mattamuskeet and adjacent canals from march 1 through November 1, or as otherwise designated. Fishing for bass, catfish and bream is excellent in the canals and along the lake shore in the spring and fall. herring dipping and blue crab fishing at the water control structures is a very popular sport enjoyed by all age groups. herring dipping is permitted from March 1 to May 15 and crab fishing is permitted year-round from the water control structures. All fishing oriented activities must be conducted in accordance with state regulations. Bow fishing for carp and other rough-fish is permitted during the fishing season. The Mattamuskeet Refuge provides for quality public hunting of swans, ducks and coots. In recent years. a effort to control the deer population as resulted in limited deer hunting. For current information on hunting dates and procedures, contact the refuge manager. During the fall and winter, concentrations of Canada geese, tundra swans and ducks of many species are a delight to both wildlife observers and photographers. The endangered bald eagle may also be observed during the fall, winter and early spring. During the summer months, many species of songbirds and marsh birds are a common sight. Occasionally broods of black ducks and wood ducks can be observed in the canals and around the lake's edge. Osprey, wood duck, and bald eagle nests are occasionally visible. Year-round residents include, but are not limited to, the white-tailed deer, marsh and cottontail rabbits and gray squirrels. Species not so frequently observed are the bobcat and river otter. The refuge is open to daylight use only, except as posted. Prohibited activities include: camping, littering, swimming, molesting wildlife and collecting plants, flowers, nuts or berries. Certain collections may be made under special use permits available through the refuge manager. Also prohibited, unless specifically authorized, are open fires, firearms and fireworks. Airboats, sailboats, jet skis and windboards are prohibited on the lake. The speed limit on refuge roads is 25 miles per hour, unless posted otherwise. Motorized vehicles are not allowed beyond designated roads. Boats may not be left on the refuge overnight. Stay at least 50 yards away from nests. Report disturbance or harassment activities to the refuge personnel as soon as possible. NC Highway 264 is the east/west main thoroughfare, with access from the North via NC Highways 45 & 94. Refuge entrance is on Hwy 94, approximately 1 mile North of the intersection of Hwys 264 & 94. Ferry service (schedule) available from Ocracoke Island to Swan Quarter on the mainland.